Dopamine, a signaling chemical in the brain, has the lofty job of controlling emotions, moods, movements as well as sensations of pleasure and pain. Dysfunction of this critical neurotransmitter is the cause of a number of diseases, most notably, Parkinson's disease. Parkinson's disease is caused by the death of dopamine-producing cells and most theories of disease risk involve the selective vulnerability of ageing dopamine neurons to genetic mutations or to environmental toxins, or both. By visualizing the dopamine neurons in the "brain" of a tiny worm called C. elegans, neuroscientists in the lab of Randy Blakely, Ph.D., professor of biomedical science in Florida Atlantic University's Charles E. Schmidt College of Medicine and executive director of the FAU Brain Institute, have identified a novel pathway that sustains the health of these cells. In a study published in PLOS Genetics, Blakely's team provides evidence that the normal actions of swip-10 to protect dopamine neurons are indirect, derived from the gene's action in support cells called glia that lie adjacent to the dopamine neurons. Although glial cells have been recognized for years in worms and humans to play a critical role in shaping neuronal development, structure, and function, the new studies offer a clear demonstration that glial cells also keep dopamine cells alive. In 2015, while at Vanderbilt University, graduate student Andrew Hardaway and Blakely, reported the discovery of the gene swip-10 in a screen for genes that modify dopamine signaling. They found that when swip-10 is mutated, dopamine neurons become more excitable, releasing excessive amounts of dopamine. Additionally, Blakely's team found that the changes in dopamine release were a result of overstimulation of dopamine neurons by the amino acid glutamate. When not serving as an energy source, or as a building block of proteins, glutamate acts to communicate excitation between nerve cells at nerve cell synapses. "When we found that the dopamine neurons were being overly excited by glutamate we figured that they were healthy, just overstimulated, like a person with one too many cups of coffee," said Blakely. "However, work has shown that if the excitatory actions of glutamate are not tightly controlled, the neurotransmitter can turn toxic, stressing neurons to the point of death." Indeed, when Blakely and current graduate student Chelsea Gibson, lead author on the new study, studied the swip-10 mutant worms whose dopamine neurons had been made to fluoresce so that their full shape could be visualized, they saw that many of these cells had what appeared to be swollen, misshapen or fragmented processes, as well as shrunken cell bodies, clear signs of unhealthy neurons. Follow-up studies by David Hall, Ph.D., at Einstein University, using an electron microscope, confirmed Blakely's suspicions – the dopamine neurons in the swip-10 mutants were definitely not normal. In Blakely's prior studies showing that the dopamine neurons were overstimulated by glutamate, they were able to restore normal dopamine neuron activity by placing a working copy of the swip-10 gene back into glial cells. "Putting the gene back into the dopamine neurons really did nothing to impede their degeneration," said Gibson. "But restoration of swip-10 gene in glial cells did the trick. Moreover, when we took away specific genes needed for response to glutamate, the dopamine neurons also got healthier." The researchers believe that improper control of glutamate by glia, while not the only factor, is an important reason why the dopamine neurons die. More than 15 years ago, Blakely's team reported that an exogenous toxin known to kill dopamine neurons in rats and mice also could selectively kill the worm's complement of dopamine neurons. Although this was an exciting finding, and encouraged other groups to consider use of the worm to study mechanisms of Parkinson's disease, Blakely moved away from research on neural degeneration because he wanted to identify genes more relevant to dopamine-linked disorders where dopamine neurons can malfunction, but do not die, such as ADHD, addiction and schizophrenia. "It looks like we have come full circle," said Blakely. Ongoing research in the Blakely lab is oriented toward understanding what the protein made by the swip-10 gene does in normal cells and how the loss of swip-10 in the glial cell neighbors leads to dopamine neuron degeneration. "Swip-10 has the molecular structure of an enzyme, but as of yet, we don't know what molecule this enzyme is targeting. Once we can determine this we should have important clues as to how glial cells keep dopamine neurons healthy, findings that may provide us with a path to Parkinson's disease medications," said Blakely. Blakely's group has identified mouse and human forms of swip-10, and recently eliminated this gene from mice. Now they are working to determine whether dopamine neurons malfunction or die in these animals. Strikingly, a former Blakely graduate student, Cassie Retzlaff, recently reported that a neuroprotective drug, ceftriaxone, binds to the protein made by the human form of the swip-10 gene. "This finding really got our attention, particularly as work to date in rodents with ceftriaxone suggests that the drug's neuroprotection involves an action on glia that results in a suppression of glutamate signaling between neurons," said Blakely. 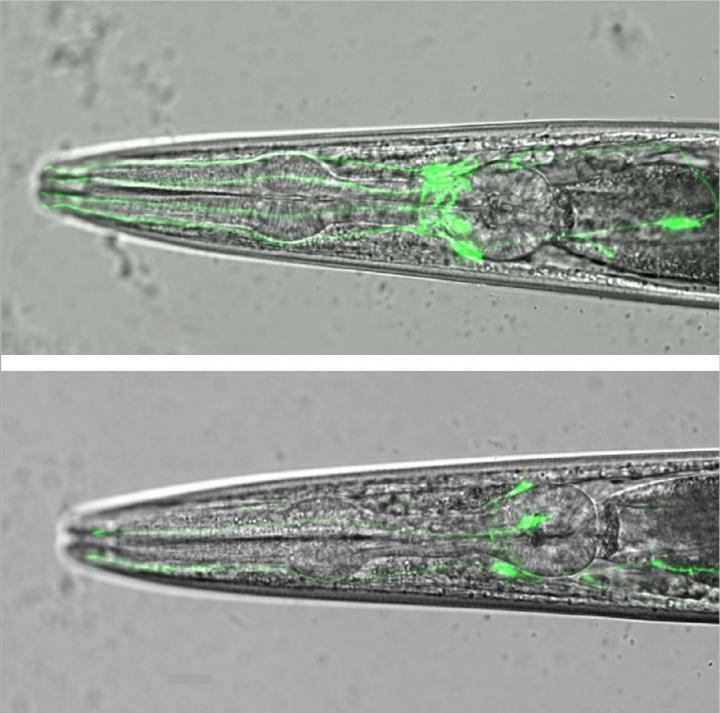 "The idea that worms lacking swip-10 may provide important insights into Parkinson's disease and its treatment now seems much less far-fetched." According to the Parkinson's Foundation, more than 10 million people worldwide are living with the disease. The research was funded by grant MH095044 from the National Institute of Mental Health. Inaugurated in 2016 on the John D. MacArthur Campus in Jupiter, Fla., the FAU Brain Institute supports research, education and community outreach among more than 100 faculty level researchers at FAU and its affiliate research centers. One of FAU's four pillars that guide the University's goals and strategic actions, the Institute seeks to unlock the secrets of brain development, function and plasticity and how the mechanisms uncovered can be compromised to drive devastating brain disorders. From the study of neuronal development and signaling to investigations of brain diseases including addiction, autism, Parkinson's and Alzheimer's disease, researchers from FAU's Brain Institute seek to generate knowledge that benefits society. For more information about the Institute and its members, visit http://www.ibrain.fau.edu.